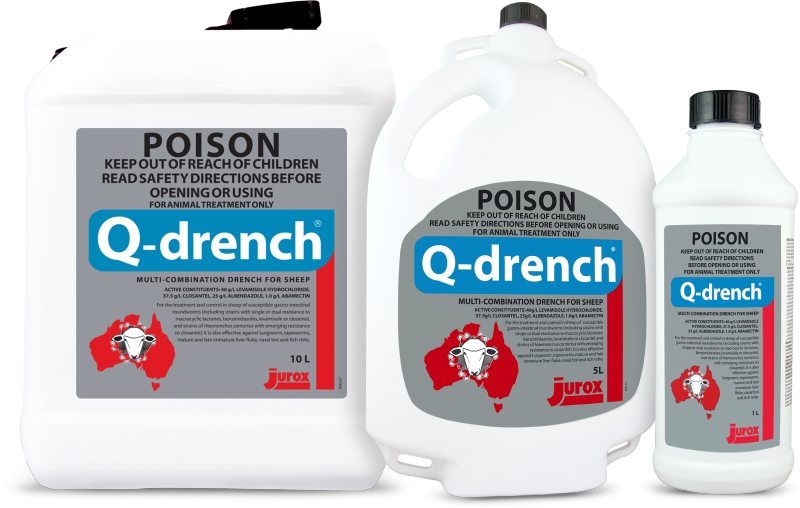 Q-drench is a short acting, 4 way combination sheep drench. Q-drench contains 4 actives with 4 different modes of action at 4 fully effective doses. Q-drench is the ideal choice for strategic treatments such as weaning, pre-lambing, quarantine, primer and exit drenches which rely on the highest possible efficacy to achieve their aims. Using Q-drench as part of or within a season drench rotation will increase sheep productivity and help delay the development of parasites resistance to existing drenches. Treatment and control in sheep of sensitive strains of the following parasites of sheep. Barber’s Pole Worm ~ Haemonchus contortus - including inhibited L4 stage and strains with single, dual or triple resistance to macrocyclic lactones, benzimidazoles, levamisole or closantel, and strains with emerging resistance to closantel. Black Scour Worm ~ Trichostrongylus colubriformis - including strains with single or dual resistance to macrocyclic lactones, benzimidazoles or levamisole. Liver Fluke ~ Fasciola hepatica - mature fluke and late immature forms including 6 week old stages. Reduces the output of viable fluke eggs. Milk Do not use in female sheep which are producing, or may in the future produce, milk or milk products for human consumption. Sheep in excess of 75 kg to be dosed at 1 mL per 5 kg bodyweight.